When we brought a 46″ screen in to the office, we realized the logical place to put it was on the wall. The only suitable wall already had a bunch of frames on it. Relocating the frames would not be a difficult DIY project, but re-aligning them would be a chore. Getting the frames just so had always been a lot of trial and error. Fortunately, we got a Hang&Level picture hanger a few months back, and this is the perfect opportunity to give it a FirstUse test. 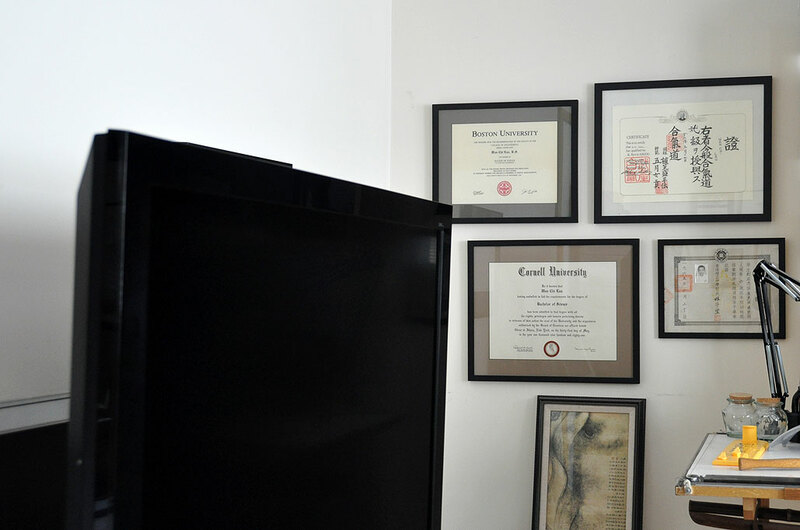 To properly hang a group of frames, we used to measure, mark, nail, and readjust the frames many times before we were satisfied with how they looked. The issue was two-fold: the right spot for the nail was located behind the frame, so centering the frame and marking the spot was difficult. There was usually slack in the wire in the back of the frame, and that made aligning and spacing of the frames difficult. The Hang & Level tool was invented to address these problems. The steps were simple and intuitive. The frame to be hung is placed on the tool. The frame/tool is placed against the wall. Once we were satisfied with the frame’s placement, we removed the picture from the tool but kept the tool in place. The steel points on the back of the hanging hooks on the tool enabled the marking of the EXACT spot where the nail should go. There is no longer a need to account for the wire slack because the frame was hung on the tool the entire time. It also made it a one person operation. We were quite impressed with how much easier the Hang & Level made hanging the frames. The task of placing, nailing, and hanging took less than fifteen minutes for the four frames. Best of all, we got the placement of all four fames exactly where we wanted them on the first try. The space is now cleared for the LCD mount installation. We will need to move some of the monitors and reorganize some of the media equipment under the desk before installing the LCD mount. Thanks to the incredibly easy to use Hang & Level, we are one step closer getting the LCD screen up on the wall.